SEPT 18 – I thought I would track airline ticket prices for a while to see if there is any pattern. I’m using Southwest airlines as that’s the one I usually take. I just recently paid $160 (one-way) for a ticket, but now the price has jumped to $233. This is starting on Sunday – Sept. 18th – around five months before we need to travel. I also signed up for email alerts and alerts on my iTouch to see if that my help also. 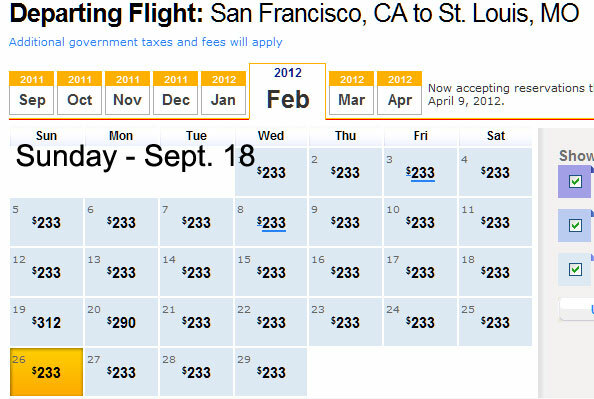 OCT 18 – Prices have finally gone down temporarily (72 hours) to $125 one way, but it’s only good through February 15th. Oct. 25 – Prices went down to $125 for my date at certain times. Posted on September 18, 2011, in Saving Money. Bookmark the permalink. Leave a comment.